The application of essential oils varies and depends on the preference of an individual. You may have a diffuser for the car, candles, essential oil burner, spray bottles or even for soaps. I never used the roller bottle before; two years ago I decided to use it. 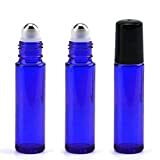 I have tried the roller bottles for perfumes and found out that they were easy to use, it seemed like they may not work well with the oils. So, I experimented with a blend of essential oils which proved me wrong. I discovered that the roller bottlers worked well. The benefits of the roller bottlers include easy application, better storage, no leaks, and the pieces are just a genius art. 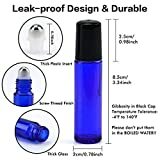 Are essential oil roller bottles helpful? If you love essential oils, you will know how vital the roller bottlers are. They make the application easier and simple. They also save you money and time. You can use the bottles for rollerball remedies, massage oils, dilution of essential oils, roll-ons, aromatherapy, essential oil blends, beauty sticks, and others. The roller bottles make it easy and simple to apply the essential oils. You can use them for single oils like peppermint or lavender. You don’t have to fumble with the oils when you have the roller bottle; you just roll the oils where you want to. Essential oils are important, and they should be kept well to use them longer. The roller bottles that are made for essential oils tend to be durable and hard. This is because they are used often. They are meant to create space for other items without giving away. The roller bottles make the application of oil easier and less messy. You can blend your favorite oils and keep them in the roller bottles for convenience. So, it is important to have the bottles. The roller bottles are light and small. You can easily take them with you. Once you have blended your oils and placed them in the bottles, you can carry them in your bag easily, because they occupy less space. The oil cannot spill in your purse. The glass bottles are hard to break even when knocked. If your skin is sensitive, the roller bottles may be a great option for testing the oils before using and achieving the best level of dilution. Once you get the desired blend, keep it in the bottle and use as needed. The roller bottles make the process of diluting oils convenient. You dilute the oils and keep them immediately. Instead of diluting in another container and then filling the bottles, the oil can be diluted in the roller bottles. When it comes to children, you need a little amount of oil. Roller bottles help in dispensing an appropriate amount of oil. You may not end up with excess oil which may be excess on the kids. There are different types of roller bottles in the market. They have different sizes, material, and color. You can choose plain or fancy bottles. I have tried a few bottles and I’m going to share what worked for me well. The plastic bottles can be affected by the oils after some time. Glass bottles cannot deteriorate no matter how long they are used. Plastic bottles may contain chemicals which may contaminate the oil. It is important to invest in roller bottles that are made of glass. The best roller bottles should have dark colors to help in preserving the properties of the essential oils. The dark color will prevent the harmful rays and light from altering the composition of the oils through oxidation. A roller bottle with a removable top is easy to use and refill when you run out of your essential oil. This may help to save money. Some roller bottles come in sizes of 10 ml, 7 ml, 5 ml or 2 ml. Most recipes require a standard size of 10 ml, and they fit well in the bottles. The 5 ml bottles are ideal for traveling. The stainless steel balls may last longer when compared to plastic balls. The plastic balls are not long-lasting, and the oils may break down the plastic after some time. In the package, you get 24 pack cobalt blue glass bottles. They have balls made of stainless steel. 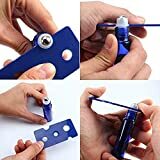 You also get three droppers, six extra roller balls, and two bottle openers. The roller bottles can be used for essential oils, perfumes, and other liquids that you may want. The stainless roller balls are resistant to corrosion. They are tight to prevent any leakage. The bottles are made of glass that is resistant to corrosion. The glass is thick, smooth, and anti-shock. Cobalt blue color prevents the oil against the harmful rays. The packaging is secure, safe, and convenient. It can fit in a purse perfectly. Two openers are used to remove and open the orifice reducer insert. The bottles are of high quality when compared to other amber roller bottles. They are also attractive. This roller bottles cannot break easily even after a long time of use and several travel situations. In a glass bottle, the oil cannot be contaminated by any chemicals from outside. The tip of the roller allows enough oil to be applied. There is no excess oil to worry about or spilling. Steel balls make the application process easy and the rolling effect smooth. 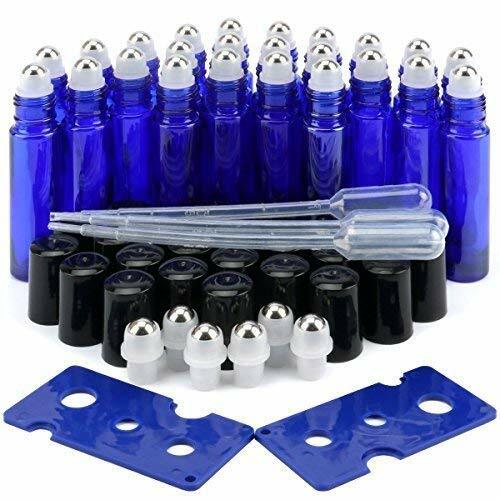 Esarora cobalt blue essential oil roller bottles are beautiful tools that can be used in different ways to DIY perfume, essential oils, and other oil blends. The bottles are easy to use and convenient. Nevertheless, before you buy the bottles, remember to check the material, size, color, and ease of use, this will help you to buy what will meet your needs.